Don’t settle for bland. Your website should attract new and current clients. 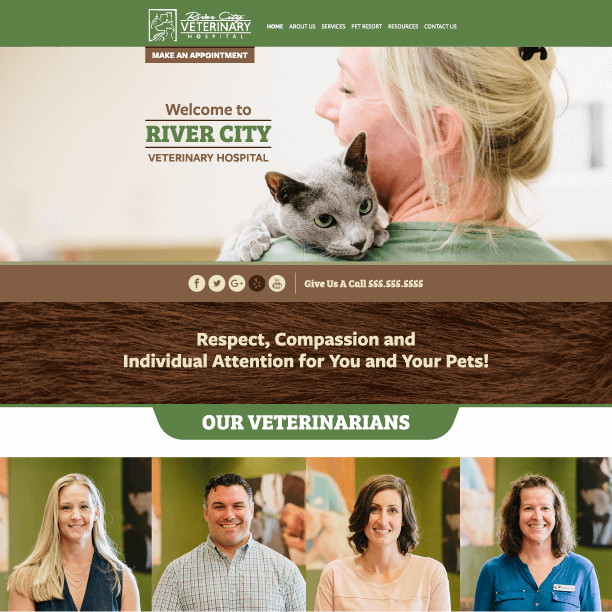 A solid website is one of the most powerful marketing tools available to veterinary hospitals today. 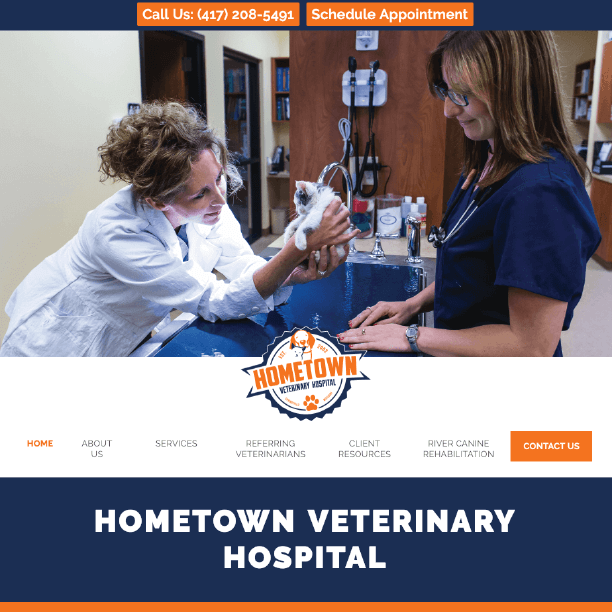 With a clean, well-designed, well-written website, your veterinary hospital is more visible online, meaning more clients will be able to find you and schedule appointments for their pets at your clinic. 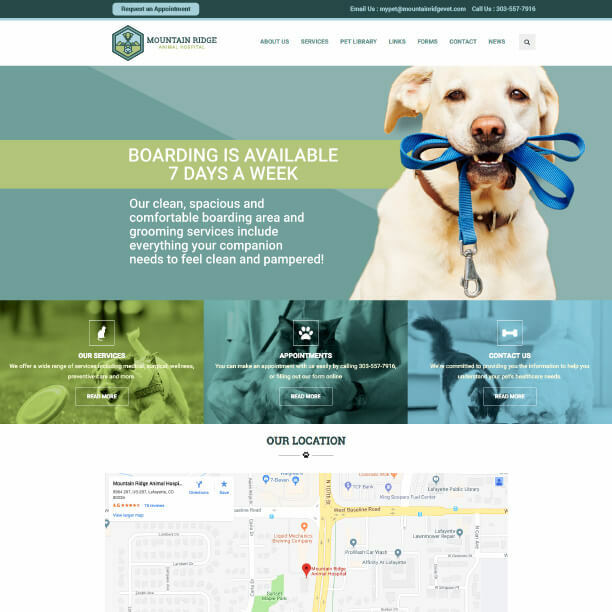 Your website is often a new client’s first impression of your veterinary hospital, so it should speak to your specific hospital and the pet care services you offer, and it should set you apart from your local competition. A streamlined and high-powered website comes free with both iVET360 Service Levels. 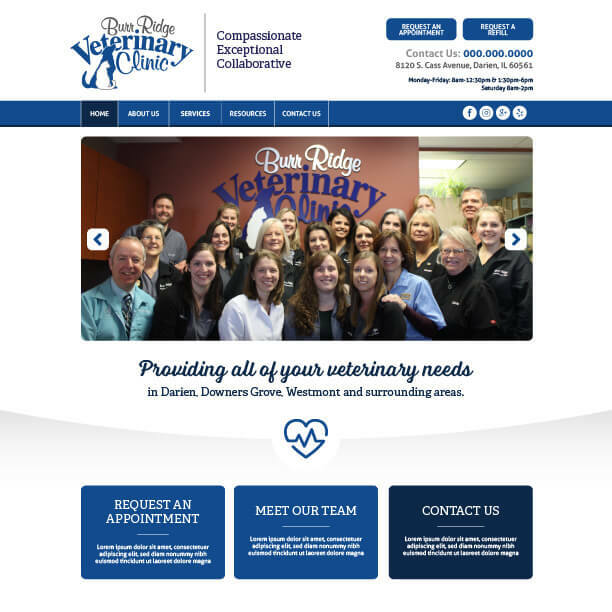 You shouldn’t have to pay extra to have a fantastic, customized, workable website for your veterinary practice. 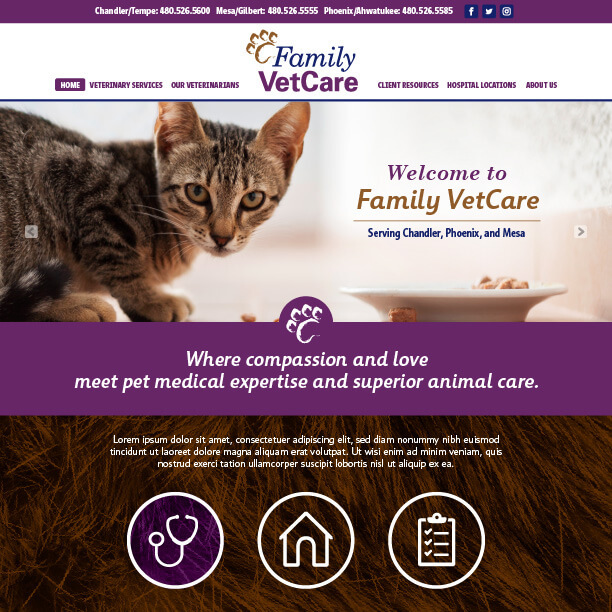 Your website should include information on the pet care services you offer, ways to contact your veterinary hospital, your hospital’s guiding principles and basic biographical information about your veterinarians and veterinary staff to make your clinic feel more personal. We can use your current website’s content, or we can work with you to develop brand new, SEO-friendly content that is tailored to your hospital and your voice. SEO (search engine optimization) makes your website even more visible to search engines like Google and Bing. It helps new clients find you—before they find your local competitors. Every month, you’ll receive a branded diagnostic report on your website’s health. This report details domain authority, visibility on search engines, where your site ranks for top local and national keywords, web pages where your site has been linked, analyses of potential page issues, total website views and traffic from social media. This report allows you to keep a consistent pulse on your site. It also assures you that your iVET360 Marketing Manager stays on the path of the ever-changing search landscape. 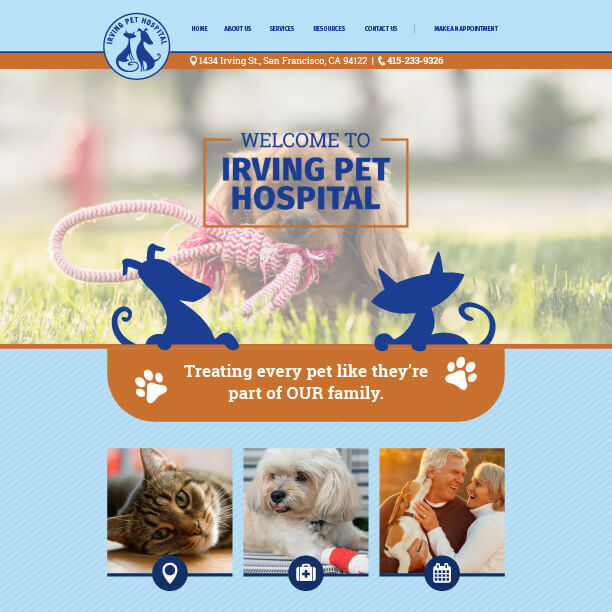 iVET360 links your veterinary hospital’s social media pages—like Facebook, Twitter and Instagram—to your website so your clients can easily stay connected to you. 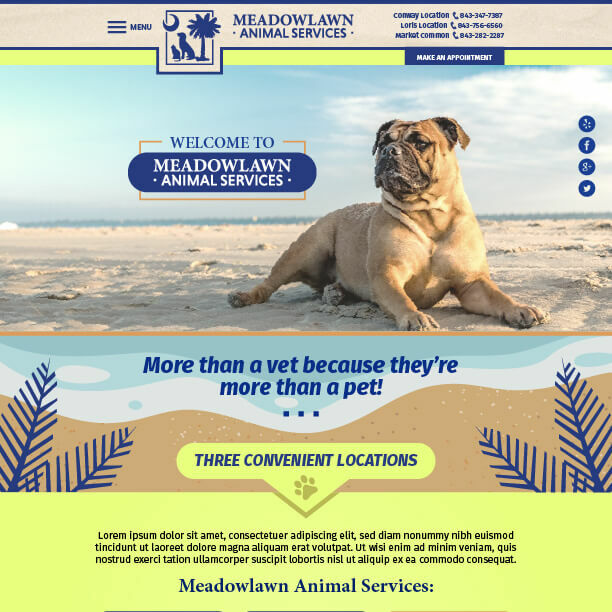 Social media presences keep your clients engaged with your veterinary clinic, and by connecting these pages to your website, your clients can easily find you on these social sites. Our team is always available to answer questions about your website and make any necessary adjustments to it. We make basic changes within 24 hours, but most changes will take effect within minutes. Common ongoing edits include setting up conversion codes for AdWords, tweaking SEO so your site ranks higher on search engines, changing landing pages to other digital ads and updating call tracking numbers. The Americans with Disabilities Acts (ADA) is a civil rights law that prohibits discrimination against people with disabilities—this act can extend to website functionality. Therefore, having an ADA-compliant website is an absolute necessity for any practice—not just to follow the letter of the law, but more importantly, to make sure that your site is user-friendly for all people. 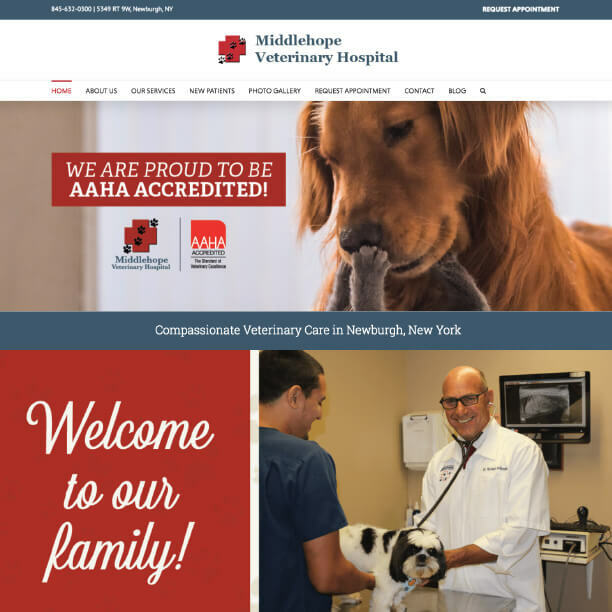 As an industry-leading veterinary services provider, we are proud to say that 100 percent of our clients’ websites are ADA-compliant. iVET360’s veterinary websites are dynamic, responsive and easy to read. All of our sites are designed based on data from the hundreds of websites we’ve built for the industry. 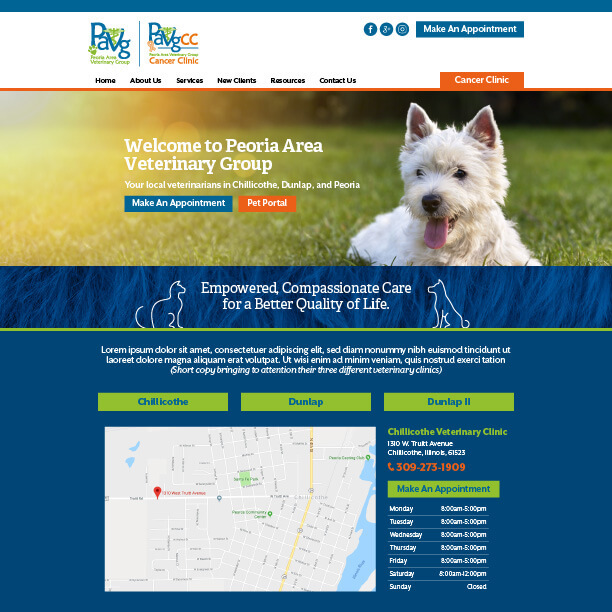 With our well-organized layouts, your clients will never have trouble locating important information about your veterinary hospital, like the pet health care services you offer and the days and times you are open. 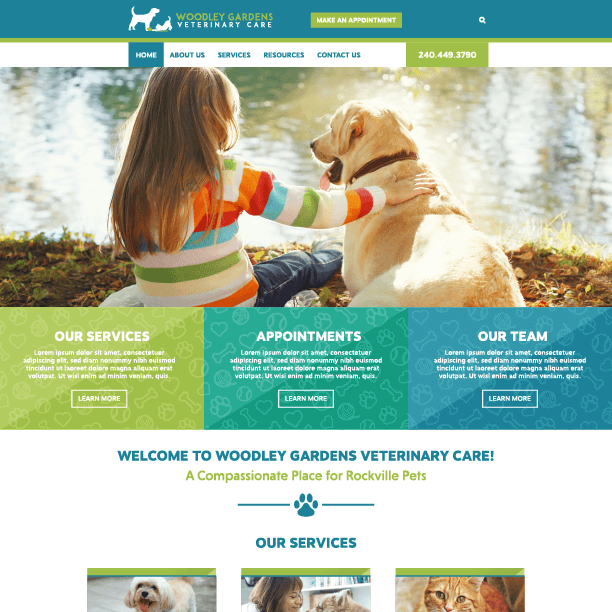 We’ll tailor the design so it speaks to your veterinary hospital’s brand, and it will work and look great on computers, tablets and mobile devices, an adaptability Google loves and requires. We can use images from your hospital if you’d like, or we can use photos from our comprehensive image library that speak to your veterinary hospital and your specific audience. Website analytics allow you to see how well your online marketing initiatives are driving up your website traffic. Plus, by tracking how many people visit your website and how they got there in the first place, we can then implement marketing plans to drive up site traffic even more. We’ll host your website on a cloud server, so your veterinary hospital’s website will have quick loading times and will be safe and secure. Cloud web hosting uses the virtual resources of several servers to accommodate all aspects of site hosting. This cluster of servers is what is known as the cloud. Cloud hosting balances server load, ensures site security and allows us to use hardware virtually when needed. Our staff monitors this 24/7 to ensure your site is up and available over 99% of the time. SSL certificates establish encrypted connections between servers and site users so all transmitted data is protected and safe. Several visual cues will show site visitors that your website is encrypted and secure. The most recognizable is the replacement of the “http” protocol with “https.” Next to “https” somewhere in the browser’s status or location bar is another visual cue: a picture of a lock. Google favors https sites, so changing to https gives your site a minor ranking boost as well. Firewalls protect your site from attack, and detection software can eradicate malware before it wreaks havoc on your website. We’re able to fight off common attacks like cross-site scripting (XSS) and SQL injection. Short for weblog, this content can generate leads to your site. An online advertising service for brief advertising copy, product listings, and video content.